Kurt Vinnedge (vinn) has posted a few great spaceships this week and these two are well worth sharing. 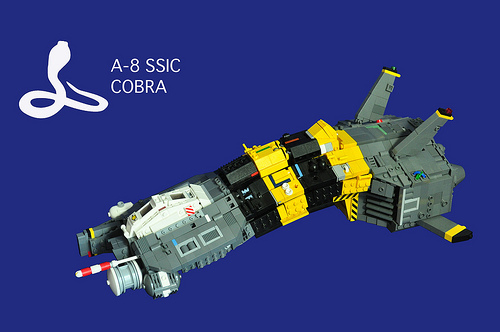 The first is this A-8 SSIC Cobra, which features a very functional looking cockpit and sensor/weapons array as well as lovely angling up and back toward the engines. 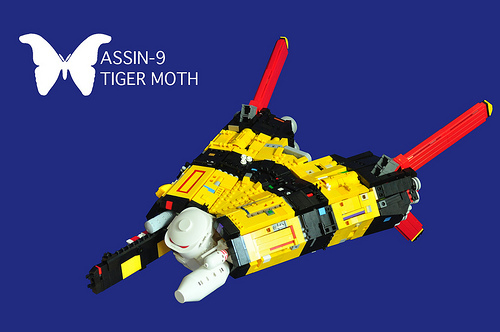 The second, the ASSIN-9 Tiger Moth, is an equal beauty with similar livery, but its highlight for me is the way he’s built the engines in a ‘V’ going off to the sides from the cockpit. The most subtle, yet effective, feature is the little bits of red peaking out from under a radar dish covering the cockpit. Angry beady little red eyes. If you want to see these in person, Kurt will be taking them to Brickfair near Washington, D.C.